The schedule below is in effect until further notice. For further information please call 416-736-2100 extension 22546, or e-mail transit@yorku.ca. The Shuttle Service operates MONDAY through FRIDAY (except for University closures), and is available for York University community members only (York University Identification may be requested). The GO Train services the Barrie/Bradford-Union rail line (Barrie- Bradford- East Gwilliambury - Newmarket- Aurora - King - Maple – Rutherford - York U- Toronto Union). York community members wanting to access 4747 Keele Street will be picked up and dropped off by the shuttle bus at the TTC bus stops located on the north and south sides of Canartic Blvd., according to the schedule below. The shuttle bus is on a very tight schedule, please be waiting for the bus a few minutes prior to the arrival time. 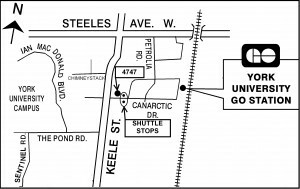 The Shuttle Bus route will always depart Vari Hall, stopping at 4747 Keele Street on both the before and after stopping at the YorkU GO Train Station. WHILE THE SHUTTLE BUS MAY NOT BE WAITING WHEN YOU ARRIVE AT THE STATION IN THE PM, THE WAIT SHOULD BE MINIMAL. Please note that the York University GO Train Shuttle Service is for York University community members only. You may be asked to show York Identification. * Passengers getting off the train arriving at York University in the evening should note that the shuttle bus may not be waiting when the train arrives, but the wait time will be minimal. * The shuttle bus is on a very tight schedule, please be waiting for the bus a few minutes prior to the arrival time.